An individual probably might not go to space anytime soon. But his /her name could. NASA is continuing its long tradition of sending people’s names into the cosmos with the Parker Solar Probe, set to blast off towards our host star (Sun) this July. The spacecraft, about the size of a small car, will travel directly into the sun’s atmosphere about 4 million miles (6.4 million km) from its surface. The primary science goals for the mission, said NASA, are to trace how energy and heat move through the solar corona and to explore what accelerates the solar wind as well as solar energetic particles. The spacecraft speed is so fast, at its closest approach it will be going at approximately 430,000 miles (692,000 km) per hour. That’s fast enough to get from Washington, D.C., to Tokyo in under a minute. Nicola Fox, of the Johns Hopkins Applied Physics Laboratory, is the mission project scientist. NASA named the spacecraft the Parker Solar Probe in honor of astrophysicist Eugene Parker. This was the first time NASA named a spacecraft for a living individual. In this photo, Eugene Parker, professor emeritus at the University of Chicago, visits the spacecraft that bears his name on October 3, 2017. 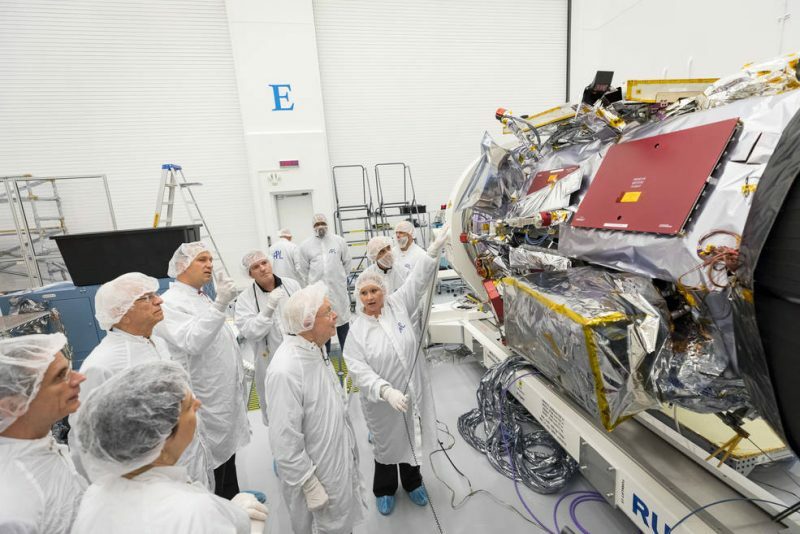 Engineers in the clean room at the Johns Hopkins Applied Physics Laboratory in Laurel, Maryland, where the probe was designed and built, point out the instruments that will collect data as the mission travels directly through the sun’s atmosphere.